The Facebook-owned messaging service said that it had acted against users of WhatsApp Plus because of concerns that the program might cause private data to be leaked to third-parties. The unofficial app offers extra ways to customise how conversations appear. Experts say Android users should be cautious about where they download apps from. WhatsApp recently reported it had 700 million users sending an average of 30 billion messages a day. It currently charges a $0.99 (65p) annual fee to users who sign up to the service after their first 12 months of using it. According to one app store, WhatsApp Plus had itself been downloaded more than 35 million times since its 2012 releases by a Spanish developer, who called himself Rafalense. Security consultant Graham Cluley said that figure sounded "surprisingly high", but acknowledged there was no independent way to verify it. WhatsApp Plus' own website appears to be offline at this time. But the moderator of a development community, which had supported it, used Google Plus to indicate that work on the software would now be put on hold. "[I] am really sorry for this but it's out of our hands and WhatsApp has pushed us into a corner that we can't escape this time. It was a fun ride but it has come to an end. "Deepest regards from Rafalense and me and all the WhatsApp Plus team for your support﻿." WhatsApp Plus offers a way to use colours and background images in chat conversations that are unavailable in the official app. In addition, it allows users to increase the size limit on attached video and sound files and also lets them prevent others being able to see when they last logged into the service - a feature it used to charge a "donation" to unlock. 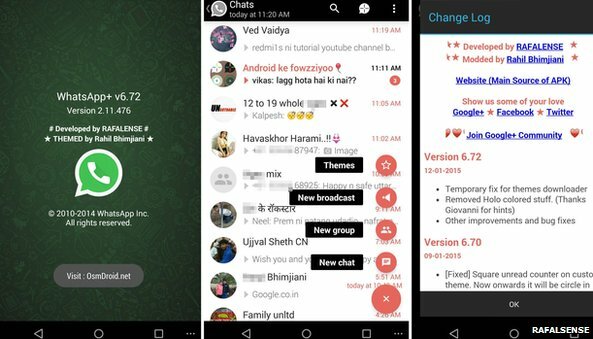 To access the features, smartphone owners must first uninstall the official WhatsApp app if it is already on their handsets. "The developers of WhatsApp Plus have no relationship to WhatsApp, and we do not support WhatsApp Plus," a message on the official app's site states, explaining its crackdown. "Please be aware that WhatsApp Plus contains source code which WhatsApp cannot guarantee as safe and that your private information is potentially being passed to third-parties without your knowledge or authorisation." Subscribers are guided to download the official app from Google's Play store. However, even if they do so, they are told they cannot access the service for further 24 hours because they violated its terms and conditions. WhatsApp Plus was not available from Google Play - the Android developer's own store - but was promoted on several smaller alternatives. "People should be careful about third-party stores," commented Dr Joss Wright from the Oxford Internet Institute. "There are levels of quality control that are implemented by Google, which withdraws apps that are detected as being not completely legitimate, and indeed by Apple, which is incredibly restrictive about what it allows on the iOS store. "Such apps could bring with them security bugs." But he added that Facebook also had other incentives to stop independent apps latching onto its WhatsApp platform. "That could potentially prevent it from adding services later for an added cost," he said. "Or if it wants to add adverts later and ensure they are being served to the people who should be seeing them, then that it needs to maintain control and prevent the rules that it has set from being bypassed by third-party clients."